Examination of the eye. MOZAMBIQUE © Riccardo Gangale/Sightsavers. The International Centre for Eye Health published a pilot issue of the Portuguese edition of the Community Eye Health Journal in 2005. The Jornal de Saúde Ocular Comunitária is aimed at eye care workers Lusophone countries, especially in Sub Saharan Africa. Our publisher, the International Centre of Eye Health, is actively seeking funding to continue and develop the Portuguese edition. If your organisation is interested in finding out more about becoming a core supporter of the Portuguese edition, please see our core supporters page. We are also very grateful to receive donations towards the work of the Portuguese edition from individuals. 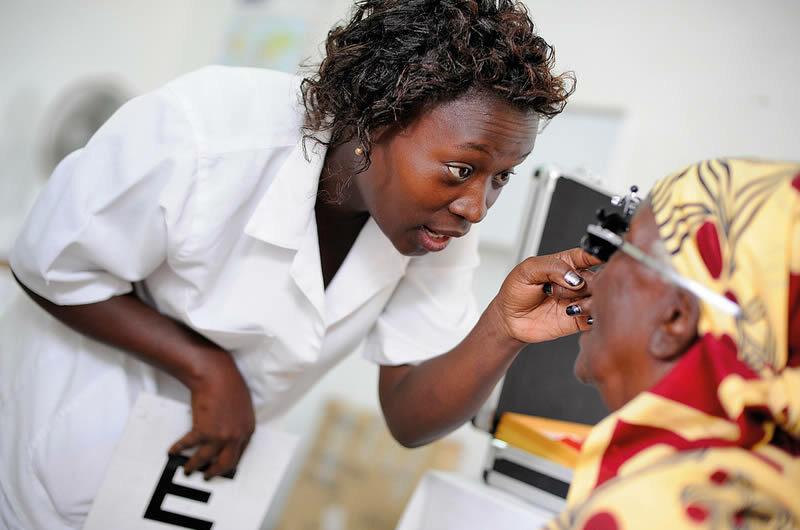 This manual, published by the International Centre for Eye Health, documents lessons learnt from two models of district eye care programmes developed in response to local conditions in Zambia and Ecuador. It also contains guidance for programme managers designing their own district programme for VISION 2020. Both our Portuguese publications are included on our annual Community Eye Health Update CD.